Having a "quick-and-dirty" experience of Geckoboard before buying additional hardware. To get the best experience, we recommend displaying your dashboards on TVs using the ASUS Chromebit, but we understand you might want to see how they look like before buying additional hardware. Geckoboard Lite is a great way to achieve that. Through Geckoboard Lite you can easily have a first experience whilst on your free trial or when iterating and designing a new dashboard. Let's face it, pretty much all new TVs have a browser nowadays. Geckoboard Lite can be enabled for your whole account via a toggle on the Send to TV modal. Even if Geckoboard Lite is enabled, you'll get the standard Geckoboard when you display a dashboard through a robust web browser. In other words, the regular Geckoboard is our default. When you display a dashboard, we detect the type of browser and if Geckoboard Lite is enabled and the browser is not powerful enough we'll use Geckoboard Lite, otherwise we'll default to our standard version. Advanced customizations aren't supported – dashboards will always display in dark theme. Small fonts aren't supported – dashboards will always display in large fonts. The dashboard footer options aren't configurable – the footer will always display with clock, title and Geckoboard logo. 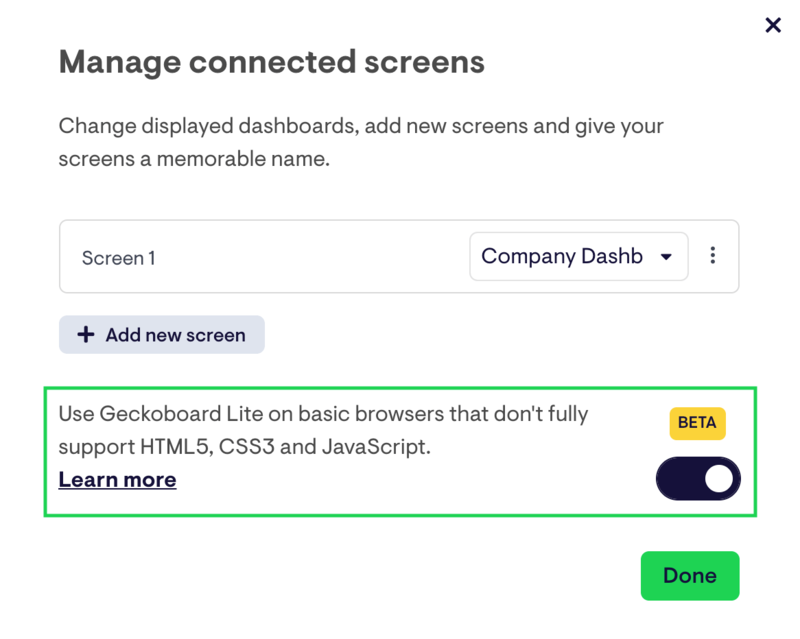 Dashboard loops are not supported – dashboard loops will automatically fall back to the standard Geckoboard version regardless of the browser type and Geckoboard Lite toggle status. Shared dashboards (dashboards displayed via a shared link) are't supported yet – shared dashboards will automatically fall back to the standard Geckoboard version regardless of the browser type and Geckoboard Lite toggle status. High-res displays (4K) will receive normal resolution (1080p) images. Error messages and loading states aren't shown. To enable Geckoboard Lite, you'll need to use Send to TV and pair at least one screen first, then from the "Manage connected screens" modal, simply enable Geckoboard Lite via the toggle. Use the same toggle to disable it, this will enforce the standard version of Geckoboard on all devices regardless of whether or not their browser is robust enough to render your dashboard correctly. Disabling Geckoboard Lite will enforce the standard version of Geckoboard on all devices, regardless of whether or not their browser is robust enough to render your dashboard correctly. For this reason we recommend keeping Geckoboard Lite enabled.